Home » Columns » Down on the Farm » Happy Birthday, German Queen! I never thought I would actually write a story about a tomato. I do not like tomatoes – only things made from tomatoes, like sauces and salsas. I have never known the joy of biting into a beautiful ripe tomato straight from the garden. But I can appreciate the joy they bring to others, like my son. This year we planted a variety of heirloom tomatoes in our new raised bed garden at Fairview Farm. I was most excited about one called “German Queen,” an inside joke at my expense. We’ve been watching our crop with anticipation all through July, and with the exception of some blossom end rots issues, things have been coming along nicely – and profusely. Today is my birthday, and we decided to can our first batch of ripe fruit. Greg brought down some German Queens, along with Cherokee Purple, Mister Stripey, Beefsteak, Mortgage Lifter, Homestead, and Golden Jubilee. 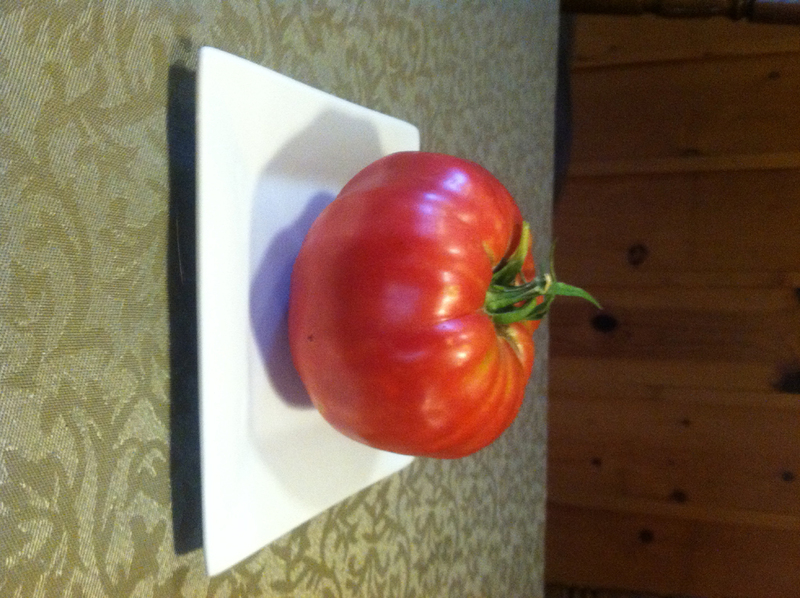 Pictured above is the most beautiful tomato I have ever seen – a huge German Queen, approximately 5 inches in diameter. I have to admit I can’t wait to taste it, or more importantly chop it up into some jars of canned tomato sauce for the winter. Happy Birthday to me! By Cathi Gerhard in Down on the Farm, Feature Stories on August 5, 2012 .